Israel and its supporters seek to improve its negative image – created through decades of human rights violations and apartheid – through a propaganda effort dubbed Brand Israel. Brand Israel aims to whitewash Israel's crimes by promoting relationships and activities encompassing cultural, sports, faith, hi-tech, legal, academic, and other realms. Brand Israel is meant to normalize Israel’s denial of Palestinian rights, pushing it to become accepted as the status quo and reframing the issue so that Palestinian resistance is cast as the actual problem. As you consider this campaign, think about what ties exist between Israel and your local government officials. Does your local government provide support for cultural projects (e.g. film festivals, performances by Israeli cultural ambassadors) that whitewash Israel’s war crimes? Does your community host forums with Israel on issues such as environmental preservation or queer rights as part of Israel’s greenwashing or pinkwashing campaigns? Do your public officials participate in projects sponsored by the Jewish National Fund or other organizations complicit in Israel’s displacement or settlements? Exert direct public pressure on local government officials to end projects underway that you discover whitewash Israel’s war crimes. 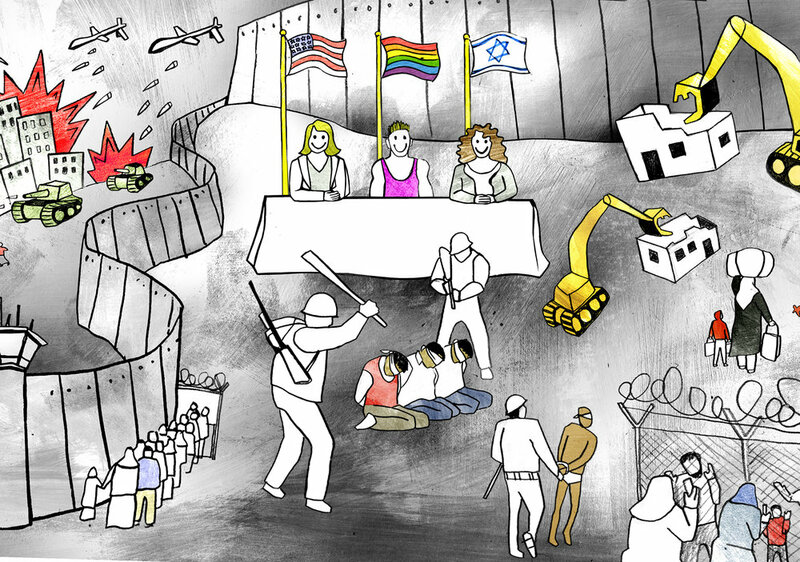 In 2012, supporters of Palestinian rights successfully campaigned to convince the Seattle Lesbian, Gay, Bisexual, Transgender, and Queer (LGBTQ) Commission to cancel an Israeli pinkwashing panel called “Rainbow Generations.” The tour was part of the Israeli government’s pinkwashing efforts, a term which refers to the disingenuous invocation of LGBTQIA rights by Israel and its supporters in an attempt to divert attention from its atrocities against Palestinians. Local queer and trans activists met with the LGBTQ Commission to explain that though the event was being marketed as an opportunity for international exchange, it was actually part of Brand Israel, and designed to foster a misleading image of Israel as a progressive haven rather than a brutal state engaged in egregious human rights violations. Graphic created by Micah Bazant, via Pinkwashing Exposed. Watch this video from Pinkwashing Exposed explaining Brand Israel.